Ha Giang, a gorgeous province in the spectacular Northeast region of Vietnam, is the land of mighty mountains, tortuous roads spreading out to the eternity, charming colorful flowers and cozy hearts of local people. Although Vietnam is experiencing a developing era, Ha Giang, a rocky plateau, still keeps its pristine condition and is waiting for beautiful spirits to explore and discover. Travel to Ha Giang and let your soul immerse in the beating heart of mountains and forests, let your mind free by the winds and dreaming waterfalls, let your heart be charmed with the fascinating colors of blossoming flowers and the golden farm brightening up under the sunshine, you will unquestionably love Ha Giang before you can possibly realize. 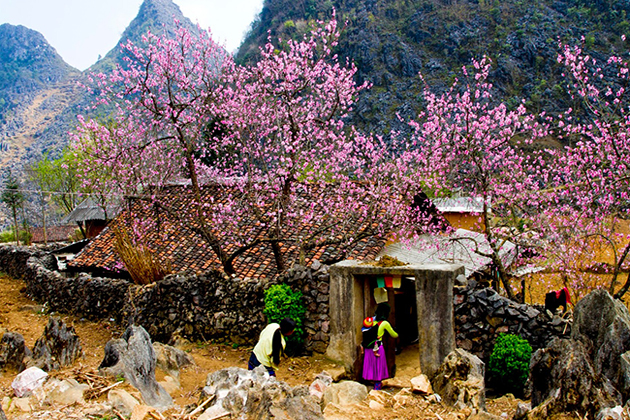 Rustic houses and ethnic people with happy smiles in spite of difficulties in daily life in Ha Giang will bring you a totally, completely different impression which nowhere else can obtain. Explore the rich culture of Ha Giang through Khau Vai Love market which is full of locals in special conventional customs or enjoys the ethnic traditional food. Join our Ha Giang tours to indulge in the charms of Ha Giang. Go Vietnam Tours values our customers and is enthusiastic about bringing them the greatest traveling experiences and worthy Ha Giang tours. Just drop us an email or give us a call, and a personal travel consultant will help you prepare a personalized Ha Giang tour or Vietnam tour that satisfies all of your needs and meet all of your expectations.